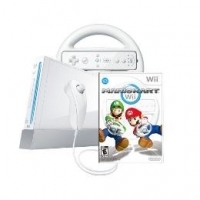 Description: Includes: White Wii Console, Mario Kart Wii, White Wii Wheel, White Nunchuk Controller, White Wii Remote Plus. This is a list of VGCollect users who have Nintendo Wii - Mario Kart Wii [NA] in their Collection. This is a list of VGCollect users who have Nintendo Wii - Mario Kart Wii [NA] in their Sell List. This is a list of VGCollect users who have Nintendo Wii - Mario Kart Wii [NA] in their Wish List.